Sakai Guides and DocumentationSakai Complete User Guide Section InfoHow do I view student memberships? 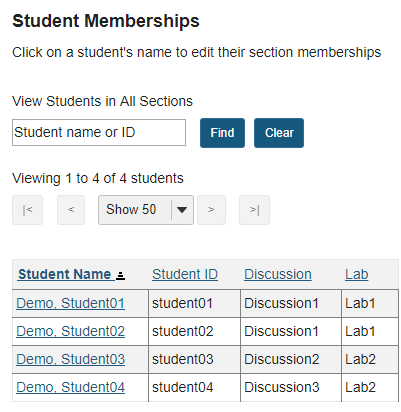 If you would like to view a list of all the students in the class which also displays the sections in which each student is a member, you can do so by viewing student memberships in the Section Info tool. The list of students and their section membership will display. 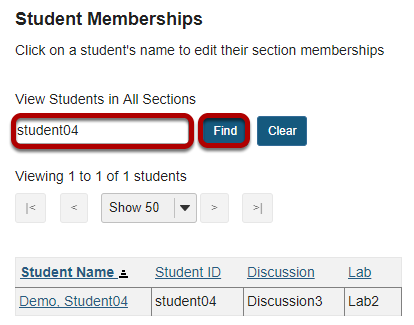 If you have a large list of students and are looking for one in particular, you may enter part of the student name or ID into the search field at the top and then click on Find to locate the information for that user. Prev: How do I add teaching assistants to a section? Next: How do I manage section options?